Home / Products / Mallet Madness Strikes Again! Mallet Madness Strikes Again!. (A collection of engaging units for mallet instruments and drums). By Artie Almeida. For Orff instrument(s), mallet percussion. Collection. Published by Heritage Music Press (30-2567H). 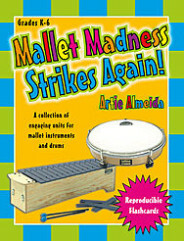 SKU: 9781429117920 Categories: Drums, Multi-Instrument, Other Tag: Mallet Madness Strikes Again! Grades K-6 – Inspiration has struck master teacher Artie Almeida once again! Catch the fever and join in the fun. “Mallet Madness Strikes Again!” features all new rhythm, melody, harmony, and timbre lessons designed for your mallet instruments, as well as the ever-popular Literature and Music Connections with lessons based on children’s literature, plus a whole new Technique Builder section to improve your students’ mallet skills. Complete lessons and reproducible visuals are sure to provide you with all of the support that you need to deliver engaging and exciting lessons for your young musicians. And don’t forget the interactive CD-ROMs, available for both Promethean and SMART software, which also include PowerPoint sides.